With deep blue waters every way you turn, romantic whitewashed houses along with a traditional and laidback way of life – it’s easy to see why the Greek islands have such allure. Island hopping in Greece is a magical way to experience the islands, bringing together a feeling of freedom, a spirit of adventure and the excitement of making new discoveries. Greece has a huge number of islands, ranging from 1,200 and 6,000 depending on who you talk to and what area of land mass they believe constitutes an ‘island’. However, just over 200 of these islands are inhabited, each enjoying a different geography and pace of life. While some are tiny and home to just a handful of families, others are larger with significantly more amenities. 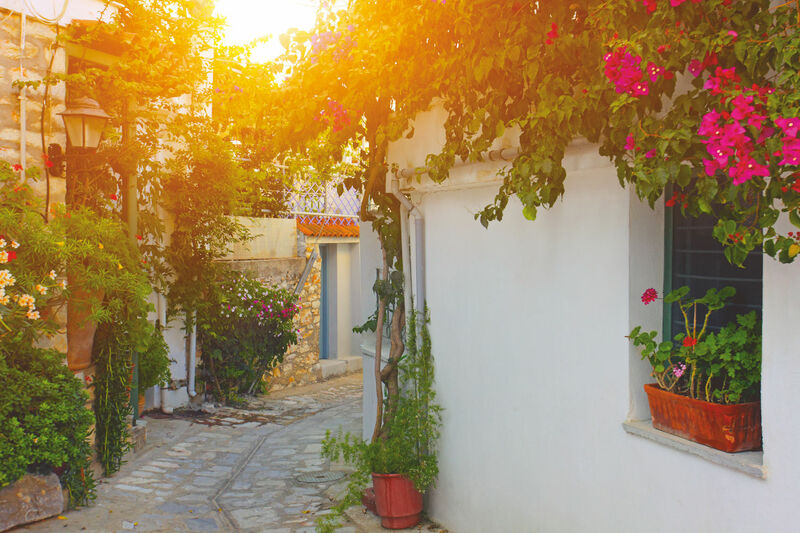 Whichever Greek island you visit, you’ll find whitewashed houses with blue rooftops, traditional tavernas serving fresh seafood and other gorgeous Greek specialities, and amazing sunsets along with postcard-perfect seaside vistas. With an extensive ferry system between the Greek mainland and the islands, island hopping in Greece is a straightforward adventure to embark on. The ferry system originally existed for islanders to be able to see their relatives on the mainland, but since the mid-1960s, these ferries have been heavily used by foreign visitors too. Everyone from high-end holidaymakers to hippies started jumping on ferries to discover the magnificent islands. Island hopping in Greece is not just a means of arriving on holiday – the journey is very much part of the whole experience. It offers the opportunity to catch a glimpse of this stunning part of the world from magnificent angles. It’s also an easy way to experience a multi-centre holiday to Greece. By visiting more than one island, travellers can have an array of amazing new experiences during precious time away from everyday life. Worth a particular mention are the Sporades Islands, found to the east of Athens. For those who want to get to the heart and soul of the Greek island experience, this is the perfect group of islands to discover. Unlike some of the other island groupings, the Sporades Islands have some thick forest cover in places, creating verdant wonderlands surrounded by twinkling seas. These islands are favourite destinations for residents of Athens too. As is the general rule with all forms of travel – if you find yourself on the same wavelength as the locals, you must be onto a winner. 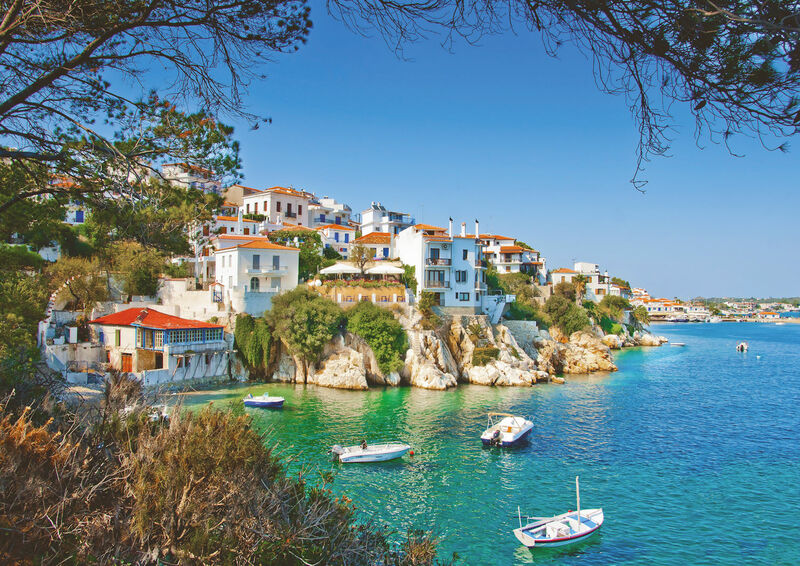 The westernmost of the Sporades Islands, Skiathos covers an area of just 19 square miles and is just 7 miles long by 4 miles wide at its furthest points. Known in particular for its 60+ beaches – many of which are sandy – the island’s coastline has many bays and peninsulas. Various woodland areas are full of different species of pine, providing some vibrant green scenery ideal for walks and hikes. Beaches and forests collide at Koukounaries, where the sandy beach is backed by Stone Pine trees. Venture a little further back and you’ll discover a magnificent lagoon, perfect for swimming and the feeling of peaceful seclusion. Skiathos Town is the island’s main settlement. A romantic town of winding streets, a beautiful harbour and a view of the fortress, Skiathos Town also has an abundance of restaurants, bars and night spots. History buffs must pay a visit to the Bourtzi peninsula. The former fort dates back to the 1200s and is a fascinating place to wander around amid the shade of the pine trees. While Skiathos Town provides some buzz to a trip to the island, the rest of Skiathos provides a slower and sleepier pace of life. Evangelistrías is an atmospheric monastery, while the ruins at Kástro are also fascinating – both can be taken in during local hikes. Famous for its beaches, there are plenty of large and small beach options to explore on the island. As well as Koukounaries, check out the two Banana beaches during the day or for a sunset drink, or visit Agía Paraskeví for its fine sand and the range of water sports on offer. Keen divers can go scuba diving off Tzaneriá beach. This adults-only property is found on a hillside near Megali Ammos beach. With just 21 rooms, the Aegean Suites exude the feeling of being in a calming retreat. Comfortable suites have separate living rooms and sea or garden views. Life’s little luxuries come in the form of a Champagne bar – ideal for pre-dinner drinks – and a gourmet Mediterranean restaurant for candlelit dinners. Daytimes can be spent by the pool, in the open-air Jacuzzi with pristine sea views, or across the road at the beach, which also has a water sports centre. For a little more activity, Skiathos Town is just a 15 minute walk along the coast. 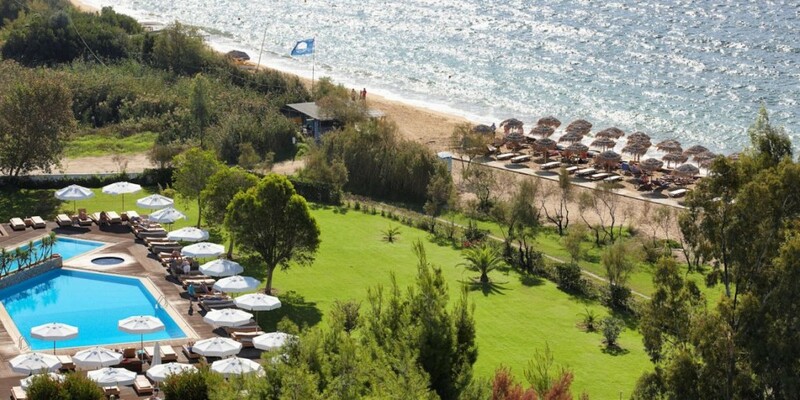 This larger hotel directly on the blue flag white sandy beach of Aghia Paraskevi is ideal for both couples and families. The Skiathos Princess has a luxurious spa with a hammam, sauna and an extensive menu of massage treatments. There’s a scuba school and other water sports available on the beach too. Alternatively, yoga classes and organised hikes help keep both body and mind active. With a kids club, crèche and choice of restaurants, this resort has something for everyone on-site. For those who like to venture out, the local village is within walking distance, and offers a slice of traditional island life. This relatively undeveloped island is all about authentic island lifestyles and stunning natural beauty. At 50 square miles, it’s larger than some of the other Sporades Islands, giving a great feeling of space. Not more than 9 miles long and 2.5 miles wide, Alonissos is green, hilly and traditional. 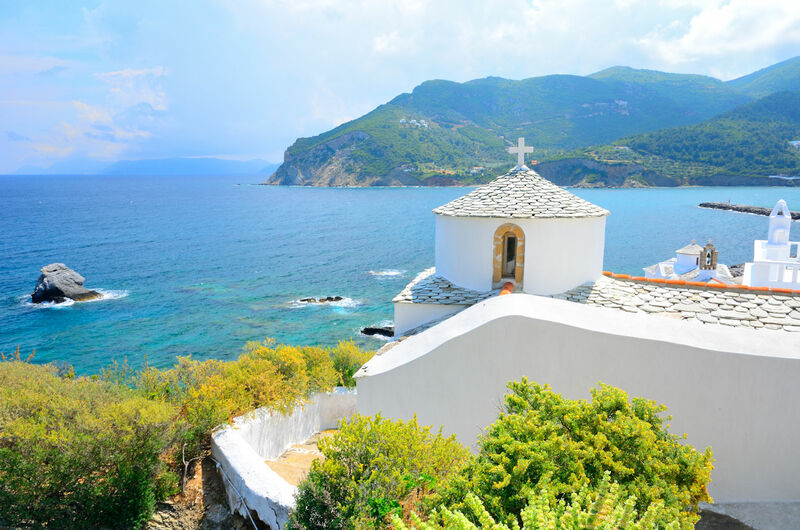 Alonissos village – locally known as Chora – is found on a hill offering gorgeous views of the island and rich blue waters beyond. A former fortress surrounded by stone walls, it’s a quaint place to spend some time. The port of Patitiri is now the largest village on the island, which has an alluring blend of forest, beach, restaurants and other amenities. The island has a network of paths and walking routes, which cut through forests, travel along coastlines and veer off to secluded bays. This means there are plenty of ways to stay active while discovering intimate corners of the island. Traditional tavernas can be found in communities across Alonissos serving staple cuisines of the Greek islands. In particular, the locally grown almonds, olives and figs must be sampled. Alonissos also finds itself in an ecologically important position of the Aegean Sea, and the whole island is part of the National Marine Park of Alonissos. It’s the largest marine protected area in Europe in an area that includes some of the smaller islands surrounding Alonissos. The area protects various flora and fauna, including maple, wild olive and juniper trees, as well as the monk seal, various species of dolphins and gulls. 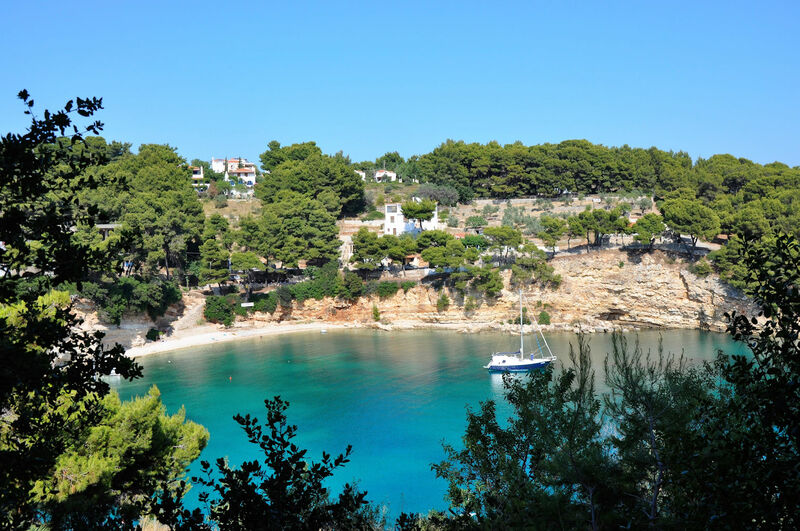 Ideal for nature lovers and those who love to soak up a traditional island way of life, Alonissos is a must visit on an island hopping adventure. 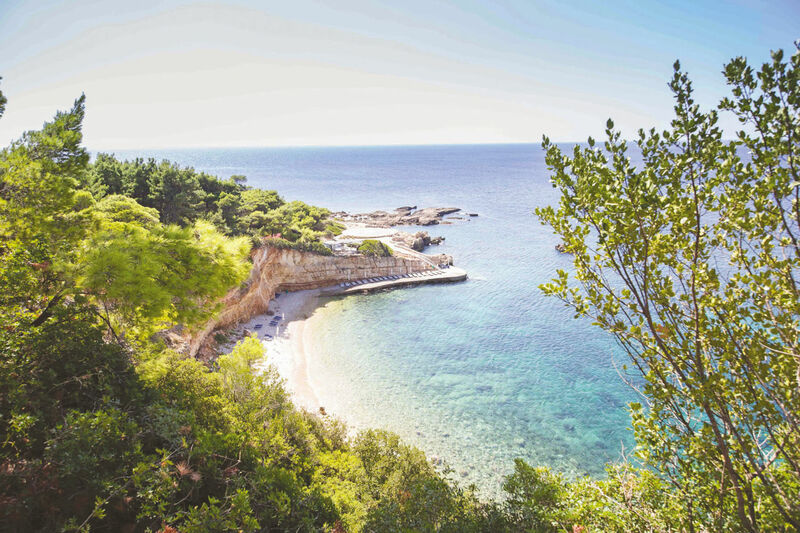 Found in a secluded location, backed by pine forest and facing the crystal blue sea, the Marpunta Village Club is a home from home on Alonissos for both couples and families. Gorgeous views take in the best of the resort’s natural surroundings, while décor blends a crisp beach feeling with turquoise splashes of colour. The active-minded have an abundance of facilities to choose from, including basketball, tennis and volleyball courts, as well as water sports, a 5-a-side football court and table tennis. 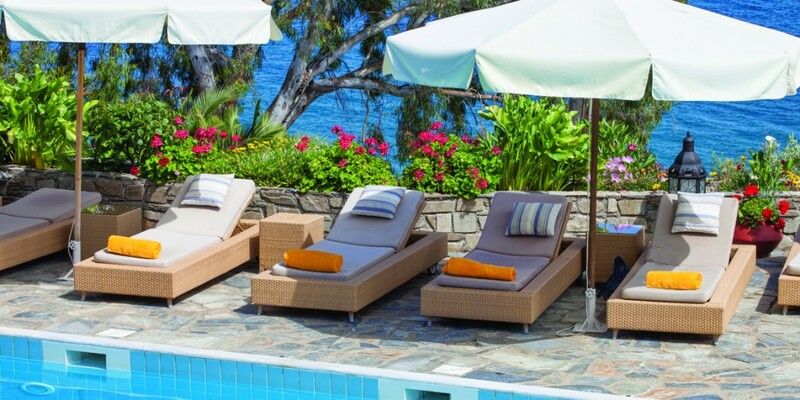 Relaxation is available in abundance too, from sun loungers on the beach by a beach bar, to a decadent massage menu. A Mini Club, babysitters and an outdoor playground keep families entertained too. Island hopping in Greece blends the spirit of adventure and discovery with traditional cultures, cuisines and unparalleled views. 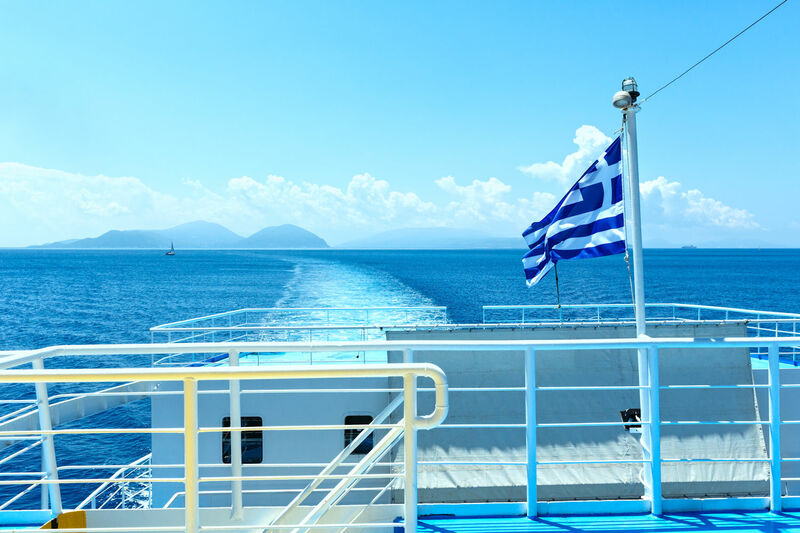 Travelling in style by boat, the journey is as exciting as the destination when hopping between Greek islands. Multi-centre holidays made easy, island hopping is a way to discover lots of different localities while travelling with the wind in your hair and the sun on your face. For a snapshot of life on the Greek islands without travelling too far from the mainland, the Sporades Islands are ideal. Take in the forests and hilly vistas, beaches and blue waters, tavernas and local culinary delicacies. Getting back on the boat again to travel to another island means saying goodbye to one place, but an inevitable hello somewhere else. Island hopping in Greece marks holidays that keep on giving.